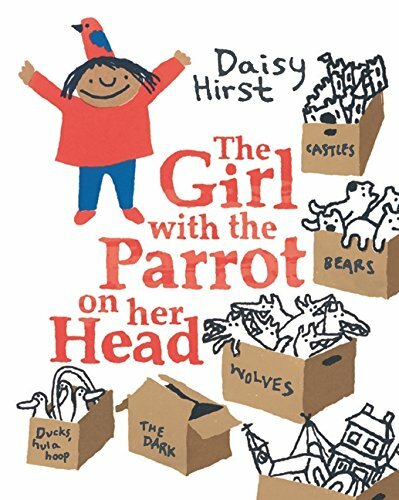 ‘Once there was a girl with a parrot on her head.’ Why? We don't need to know. The little girl's name is Isabel, and when her best friend Simon moves, Isabel is angry and decides it’s better to be by herself. She just needs the parrot, and her system. The system involves boxes, but what about the wolves – are they too big for the box? Luckily an especially big box arrives – and a new friend, Chester. This is a delightful story about loss, imagination and the value of friends (real and imaginary). The simple text, presented in clear, readable font, eschews explanation. Like the best books by such authors as John Burningham, it presents the reader with a story that works on different levels making it satisfying to both an adult and child audience. Hirst is also the illustrator, and a talent to be welcomed. Her simple, bold designs created by using silk screen prints are the perfect accompaniment to this story, anchoring it in the world of the child without fuss or excessive detail. Hirst invites the reader to work with her, from the clever endpapers to the cheerful opening, through the terror of the wolves in the night to the space station at the end; a station that needs two astronauts ‘and a parrot with a teacup on its head’. This is a picture book that really does stand out. Daisy Hirst is a picture book creator to watch.